We’d love your help. Let us know what’s wrong with this preview of The City on the Other Side by Mairghread Scott. When a wealthy and sheltered young girl stumbles into a pitched war between two fairy kingdoms, the fate of San Francisco itself hangs in the balance! The first decade of the twentieth century is coming to a close, and San Francisco is still recovering from the great earthquake of 1906. Isabel watched the destruction safely from her window, sheltered within her high-society When a wealthy and sheltered young girl stumbles into a pitched war between two fairy kingdoms, the fate of San Francisco itself hangs in the balance! To ask other readers questions about The City on the Other Side, please sign up. who were the characters again? The setting is San Francisco soon after the earthquake in the early 1900s. Isabel is a little girl who lives with her mother in a fancy house with servants attending to her every need. But what Isabel wants is to feel like her mother and father, who lives in Carmel, actually do love and care about her. Isabel is in for the adventure of a lifetime when she steps into a whole new world and discover two factions of faeries at war with one another. In possession of a magical necklace, Isabel just mi The setting is San Francisco soon after the earthquake in the early 1900s. Isabel is a little girl who lives with her mother in a fancy house with servants attending to her every need. But what Isabel wants is to feel like her mother and father, who lives in Carmel, actually do love and care about her. Isabel is in for the adventure of a lifetime when she steps into a whole new world and discover two factions of faeries at war with one another. In possession of a magical necklace, Isabel just might have to power to stop the fighting but she will probably need the help of a few friends. This is a graphic novel geared towards middle grade readers. This was a cute story about a little girl who just wants to feel loved. There are some good lessons along the way including learning how to get along with those who are different than you. I can't say I was particularly interested in the fairy potions of the story although I did enjoy how that part of the plot was wrapped up. Although I wish the book would have explored more of the historical aspect of 1900s San Francisco within the story, I was pleased to read the added bonus type chapter that goes into a little more detail. Overall, the book had colorful illustrations but parts of the story prevented it from being a really great read. The City on the Other Side is a graphic novel set in 20th century San Francisco, after the events of the great earthquake of 1906. The story follows young Isabel, finding herself on a quest to return a magical necklace. The City on the Other Side's story is one of urban fantasy. There is a war between the Seelie and the Unseelie, and alas, it is Isabel's job to save the day. I found The City on the Other Side to be quite predictable. The story didn't impress me too much, the writing felt like it The City on the Other Side is a graphic novel set in 20th century San Francisco, after the events of the great earthquake of 1906. The story follows young Isabel, finding herself on a quest to return a magical necklace. I found The City on the Other Side to be quite predictable. The story didn't impress me too much, the writing felt like it was rushed, and the plot could've honestly been better. I also wished that the novel included more historical background of the surroundings of San Francisco, and was disappointed to find there wasn't a lot of it there. But something that I LOVED LOVED LOVED about this book was the art. I mean, in a graphic novel, the art is 1/2 the book, and I have to say that I had no problems with it whatsoever. It was incredibly vivid, vibrant, and colorful, and it made the world so much more real. Although my digital copy was a bit blurred, obviously when this book will be published, the art in the physical form will be magnificent. Honestly, I couldn't get enough of the art. I'd read this book only for the art if I had to. Although this book wasn't personally for me, this book would be a magical read for younger readers, especially those just diving into reading. The novel has a lot of elements that appeal to younger readers looking for adventure and magic in a story, and the brilliant artwork in this book will only help its case to excel. I now choose to believe that all natural disasters are caused due to concerns on the other side of the veil. Let's all keep the other dimensions happy, ok? 🌻 Trigger warnings for (view spoiler)[minor blood/physical injuries, murder, kidnapping, fire, earthquake, disappearance of a loved one, war themes & homelessness (hide spoiler)]. 🍂 Representation: Isable (mc) is latinx; Benji (sc) is Filipino. THE CITY ON THE OTHER SIDE is an excellent middle grade graphic novel. With an interesting historical setting, a fun adventure story, and amazing artwork, this book is sure to charm younger readers. Obviously in a graphic novel the art is responsible for telling a lot of the story. I thought that THE CITY ON THE OTHER SIDE was well done in that regard. The fairies were unique and the colors super vibrant and wonderful. One aspect I really liked was the Review courtesy of All Things Urban Fantasy. Obviously in a graphic novel the art is responsible for telling a lot of the story. I thought that THE CITY ON THE OTHER SIDE was well done in that regard. The fairies were unique and the colors super vibrant and wonderful. One aspect I really liked was the creative take on the fairy world being a mirror of the human world and each world affecting the other. The way this was shown through the artwork was lovely and I really enjoyed the scenes where we saw what the fairy version of a human landmark looked like. The story was fun, and I thought it was well paced. Isabel's adventure starts pretty early on in the book, no slow starts here. Then, the action keeps up through the whole book. While I've seen some reviews that say it's a bit predictable, I didn't feel it was predictable as much as there weren't a lot of plot twists and turns, but that seems appropriate for the intended readership. I certainly didn't guess anything that was going to happen! But nothing really surprised me completely, either. 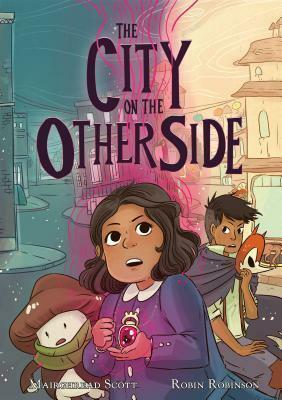 A well done story with diverse characters and amazing artwork, THE CITY ON THE OTHER SIDE is definitely worth picking up for the middle grade reader in your life. Rather predictable in terms of plot, and sorely lacking on the historical side. But this graphic novel is gorgeously illustrated and I would love to read more about the (Un)Seelie world and the diverse cast that exists just on the other side of the Veil. Perhaps with a time skip so we can see how our MCs have aged and evolved? They were a bit two-dimensional as plucky heroine and redeemed thief, so I wish more time had been spent getting to know them instead of dashing about the city. Fun, and I’ Rather predictable in terms of plot, and sorely lacking on the historical side. 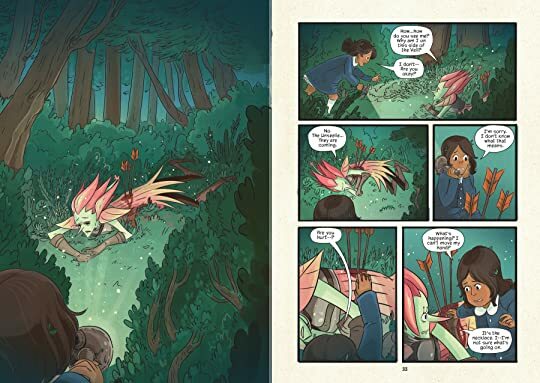 But this graphic novel is gorgeously illustrated and I would love to read more about the (Un)Seelie world and the diverse cast that exists just on the other side of the Veil. Perhaps with a time skip so we can see how our MCs have aged and evolved? They were a bit two-dimensional as plucky heroine and redeemed thief, so I wish more time had been spent getting to know them instead of dashing about the city. This was so cute! I loved the art. The fairies all looked like different kinds of monsters. It’s a good read-a-like for the Amulet books. Though, I feel maybe for a slightly younger audience. Another good one-sitting kinda read. City on the Other Side begins with a young girl named Isabel living in San Francisco just after a devastating earthquake in 1906. Isabel comes from a wealthy family and largely absentee parents and when she finds a way into the world of the fae, she encounters an adventure she never expected. When a message is left in her hands, it’ll be up to Isabel to deliver it before the wars between the fae break out into her own world. Despite not being the adventurous type, Isabel will find both friends and foes aplenty on her mission to save the worlds. City on the Other Side is a relatively gentle adventure with a young girl whose life has been very restrictive and who feels lost even among her own family. Her interactions with the fae lead to several friendships that will be tested by her role in the wars between the fae and the story plays with the concept of friendship and duty in a compelling way that will be appealing to kids. It’s also a gentler introduction to the nastier fae than most others I’ve seen and the art really makes the story come to life. City on the Other Side won’t be as exciting as experience fantasy readers might be expecting but it’s a good introduction to the nuanced view of the fae and the lovely artwork will entrance younger readers. Very cute, quick read! Loved the art style. Button was my favourite. A fun modern-ish take on the human and fairy worlds. Good story, fun art and it draws a lot of different mythologies. The City on the Other Side was such a complete delight to read. I was pretty excited to hear about the premise, as the idea of both a real world and a fantasy world co-existing is one I have always enjoyed, and early 20th century San Francisco isn't something I have seen much of in other stories. That said, this exceeded my expectations. Mairghread Scott's story worked really well for me. The characters were endearing, the dialogue was fun and funny, the story was interesting, the setting was int The City on the Other Side was such a complete delight to read. I was pretty excited to hear about the premise, as the idea of both a real world and a fantasy world co-existing is one I have always enjoyed, and early 20th century San Francisco isn't something I have seen much of in other stories. That said, this exceeded my expectations. Mairghread Scott's story worked really well for me. The characters were endearing, the dialogue was fun and funny, the story was interesting, the setting was interesting, and the ending was satisfying. It was great to see the Latinx and Filipino main characters considering the diverse history of San Francisco. The characters were interesting, and many were particularly adorable. Button was completely necessary to my life. Robin Robinson's art was fantastic and suited the story perfectly. I liked that they were willing to address that just because the bad guy is defeated doesn't mean that is the end for either those who sided with or against him. I do wish the story had been a bit lengthier, but I can't have it all. The City on the Other Side is a cutesy story of a young girl in post 1906-Earthquake San Francisco. Her distant mother ships her off to spend the summer with her artist father who seems to be too busy to pay much attention to her. Lonely, she takes to wandering and accidentally finds herself in the middle of a fairy war. When she is handed a magical necklace by a dying Seelie fae, she finds herself in the fairy realm on a mission to help find the Seelie Queen in hopes of defeating the Unseelie l The City on the Other Side is a cutesy story of a young girl in post 1906-Earthquake San Francisco. Her distant mother ships her off to spend the summer with her artist father who seems to be too busy to pay much attention to her. Lonely, she takes to wandering and accidentally finds herself in the middle of a fairy war. When she is handed a magical necklace by a dying Seelie fae, she finds herself in the fairy realm on a mission to help find the Seelie Queen in hopes of defeating the Unseelie leader. I love stories of the Fey folk, and this one was fun because it took place in an alternative version of San Francisco, which is where Isabel ends up, when she gets her hands on a magic necklace that allows her to travel to the land of the Fey. Although I love that this story took place in post 1906 earthquake San Francisco and Carmel, I find it a pity that there wasn't as much used of the actual cities. Plus the mother referring to smog, which was not that common in 1906. Considering how much of I love stories of the Fey folk, and this one was fun because it took place in an alternative version of San Francisco, which is where Isabel ends up, when she gets her hands on a magic necklace that allows her to travel to the land of the Fey. Although I love that this story took place in post 1906 earthquake San Francisco and Carmel, I find it a pity that there wasn't as much used of the actual cities. Plus the mother referring to smog, which was not that common in 1906. Considering how much of the city was destroyed, it is unclear where Isabel and her mother are even living. I sort of wish that had not been so vague. But the rest of the story, that takes place in the land of the Fey, that is quite good, as Isable finds her way through it all. She is a good strong character, and I enjoyed that part of the book. The City on the Other Side is a cute story about a young girl, Isabel, living in San Francisco after the earthquake in 1906. She is on a quest to help restore balance to the world of the Fey by delivering a magical necklace to a person in the Seelie court. This novel has a cast of endearing and interesting characters. You don't see much of San Francisco, but you do get to see Thank you NetGalley for allowing me to read a digital copy of this book in exchange for a review. All opinions are my own. I liked the art and the story equally in this one. Isabel is feeling like her parents don't really see her. They know she's there but she feels like an inconvenience. When she is sent to her father's for the summer, she accidentally stumbles into a war between the Seelie and Unseelie courts. She has to learn to find her voice and make it heard, or not everyone is going to make it out alive. The City On The Other Side is a fairly standard urban fantasy, albeit one with an historical milieu. I had been hoping to find something more original - a spark or reason for the story other than a rather tenuous tie to the 1906 San Francisco Earthquake. The historical aspects are nearly non existent (though there are some middle-grade aimed factoids at the end) and I really wanted to see 1906 San Francisco rather than the alternate fairy world. Plot: Isabel is fairly forgotten in her world - her San Francisco socialite mother binding her to the harsh mores of the era while her father lives in Carmel carving stone. One day while visiting her father, she chances upon a dying fairy. Before passing, he gives her a necklace and begs her to find the queen of the seelies and give her the necklace. Isabel soon finds herself in the middle of the cold iron war between the seelie and unseelie courts. With the help of a human boy hiding in the fairy world and stealing in order to survive, they will free the imprisoned queen and bring balance back to the fairy world. Most of The City On The Other Side is a road quest; our heroine spends a chunk of the book looking for a seelie general and then the queen herself in fairyland. Perhaps because of this, there was little to no flavor of historic San Francisco. This takes place a bit (months maybe?) after the earthquake so there is no dwelling on that event. It's just randomly explained in the story that it was caused by the unseelies as part of their war. And it's more of an afterthought at that. Our character Isabel is plucky but I have to admit that she feels just as disaffected as her parents. I never got much of a flavor of her personality or spirit other than that she wishes her parents noticed her more. Oddly, there is a reconciliation with one of them while the other remains completely disenfranchised from her daughter. Similarly, her friend Benjie is fairly cardboard and mushroom shaped seelie companion Button has an odd mix of flavors so that he is hard to pin down. Readers may be surprised at some of the seeming anachronisms. Isabel's mother's use of the word 'smog' feels off since it was a word only just coined that year. Similarly, a museum night watchman using an electric flashlight (also recently invented at the turn of the century) also feels off. Both are possible but not plausible So, too, is it glaring that Isabel is confined by social mores and not by her gender as was custom in that era. „The City on the Other Side“ war mal wieder ein englischer Comic für mich, der mich aber eher zwiegespalten hinterlassen hat. Das historische Setting im San Francisco von 1906, gepaart mit den Welten der Seelie und Unseelie, hat ziemlich große Hoffnungen in mir geweckt, aber leider wurde ich von Anfang an nicht wirklich mit der Geschichte warm. Was mich am meisten gestört hat, waren die Charaktere. Leider wurden sie alle sehr stereotypisch und überhaupt nicht facettenreich ausgeführt, gerade zu Isabel, der jungen Protagonistin, habe ich keinen richtigen Draht gefunden. Sie stolpert eher von einem Ereignis ins nächste, als dass sie wirklich etwas anpackt, und auch ihre Beziehung zu den anderen war ziemlich nichtssagend. Von ihren Eltern wünscht sie sich mehr Interesse – mehr habe ich von ihr nicht mitgenommen. Auch der kleine Pilz Button und Benjie, der auf sie aufmerksam wird, waren sehr einseitig und haben nicht wirklich zur Auflockerung oder dem Voranschreiten des Plots beigetragen. Auch der Plot war alles in allem eher zäh und überhaupt nicht flüssig. Ich mochte die Idee dahinter, aber einerseits gab es so gut wie kaum Weltenbau, die Menschenwelt wurde komplett in den Hintergrund gerückt, und der Plot an sich war auch noch ziemlich banal und schnell zu durchschauen. Aufregung kam bei mir nicht wirklich auf, Spannung habe ich vergeblich gesucht, egal, was gerade passierte. Selbst die Kämpfe waren eher lahm und nicht besonders interessant. Mir hat da einfach das gewisse Etwas gefehlt, die richtige Motivation der Helden, die eher in das Ganze reingeschlittert sind und dann eben mitgemacht haben, weil es der Plot so verlangt. Was mir aber wirklich gut gefallen hat, war der Zeichenstil. Meine digitale Vorab-Ausgabe war leider etwas pixelig, aber die Farben und die Illustrationen waren trotzdem ein wunderschönes Meisterwerk und das hätte ich gern auch in der Story widergespiegelt gesehen. Die Darstellung der Charaktere und der Städte war sehr vielfältig, nur leider waren mir manche Panels etwas zu überladen und zu wirr. The story sets in early twentieth century San Francisco, somewhere between the time of the 1906 earthquake and the San Francisco World Fair. Isabel is a young girl, who lives a sheltered life with her mother. This changes when Isabel goes to spend summer with her father and stumbles through the veil to another city, where a war rages between Seelie and Unseelie courts. The war is also affecting San Francisco, even if humans don't even realize it and Isabel is the only one who can stop it, with a The story sets in early twentieth century San Francisco, somewhere between the time of the 1906 earthquake and the San Francisco World Fair. Isabel is a young girl, who lives a sheltered life with her mother. This changes when Isabel goes to spend summer with her father and stumbles through the veil to another city, where a war rages between Seelie and Unseelie courts. The war is also affecting San Francisco, even if humans don't even realize it and Isabel is the only one who can stop it, with a help of a magical necklace and few friends. But can she do it before the fairy world and her own get destroyed by the war? I liked how the story was set in ground of a real historical event and started building and linking a magical story of friendship, war and other things into it. Isabel was a great character, not too whiny nor not too perfect either and her friends were also nicely written and versatile. Some of the Unseelie persons lacked character a bit, but had still enough that something to keep me interested in the story. The story progressed in a good phase, though at parts in the end it felt a bit jumpy and the ending came in a bit fast. The artwork in this comic is simply gorgeous. I like the historical setting of San Francisco a couple years after the 1906 earthquake, especially how it plays into the fantasy world. The character design is excellent. Scott clearly had fun with the different fantasy creatures. I wish there was a bit more to the plot, but it would have had to be a longer comic or perhaps a series if there was. Fun story with unique character designs meshed together from various mythologies. Action wasn't always drawn well and story jumped often, so the flow was choppy at times, but overall it was a fun read. Opens with a magic-folk battle, slides into a family story (kid doesn't want to spend the summer with her dad), and ultimately has ramifications for historical San Francisco. I wanted to like this more than I did, but I enjoyed all the different types of beings and creatures. An unusual setting, but it works well! I love the way the merperson on the cover "swims" through solid mediums to get around. In fact, all the fae designs are super inventive and thoughtful! The afterword explanation is very informative. The book the city on the other side is a book bey Mairghread Scott is a comic kinda of fansty book and is also a comic.It makes your imagination go wild and just go out of its place.And I recommend this book if you like fake falsity but makes it look real Then read this book.